MYH, OGG1 and MTH1 are members of base excision repair (BER) families, and MYH germline mutations were recently identified in patients with multiple adenomas or familial adenomatous polyposis (FAP). A total of 20 APC-negative Korean FAP patients were analyzed for OGG1, MYH and MTH1 germline mutations. A total of 19 hereditary nonpolyposis colorectal cancer (HNPCC), 86 suspected HNPCC, and 246 sporadic colorectal cancer cases were investigated for OGG1 and MYH mutations. A total of 14 R154H OGG1 polymorphisms were identified in hereditary, sporadic colorectal cancers, and normal controls. For the case-control analysis of OGG1 R154H, a total of 625 hereditary or sporadic colorectal cancer patients and 527 normal controls were screened. R154H was a rare polymorphism associated with sporadic colorectal cancer patents (OR: 3.586, P= 0.053). R154H does not segregate with cancer phenotypes. 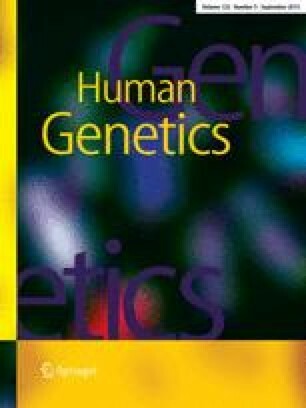 Upon examining the possibility of recessive inheritance of R154H, we could not identify any complementary mutations in OGG1, MYH or MTH1. Samples with R154H were further screened for mutations of K-ras, β-catenin, APC, p53, BRAF and the microsatellite instability (MSI) status. Eight somatic mutations were identified in these genes and G:C to T:A transversion mutations were not dominant in samples harboring R154H. This result raises the possibility that OGG1 R154H may function as a low/moderate-penetrance modifier for colorectal cancer development.